Recently I needed some rosemary. I was going to a small dinner party, and was tapped at the last minute to bring appetizers. Mindful of my financial limitations and time constraints, I resolved to not do what I normally do (i.e., freak out about whether or not my appetizers would be tasty or bountiful enough to precede a meal made by a marvelous cook). Instead, I decided to pick a few things to make that would not cost much in terms of time, planning, or money. I decided on a recipe for roasted nuts, one for cheese straws, and a white bean dip. I’ll admit that I was a little smug: kudos to me, I thought to myself, that two of those recipes call for the same herb. I haven’t bought rosemary in a really long time. When I lived in Baltimore, we had a gorgeous rosemary plant in the front of the house that produced without end. It wasn’t at ground level, so I didn’t freak out about the possibility of animals (or people) peeing on it, and if we ever ran out (impossible), the neighbors had an even more prolific plant from which to harvest. During those glory days of the Abundant Rosemary, I would sometimes spot other people buying rosemary (buying rosemary; can you imagine?!) at the market, and I’d look at them with some mix of pity, sorrow, and shame. I wanted to tell them that they never needed to purchase it; just visit my street and they could have it for free. In any case, what this era gave me was the feeling that I should never spend money on rosemary. 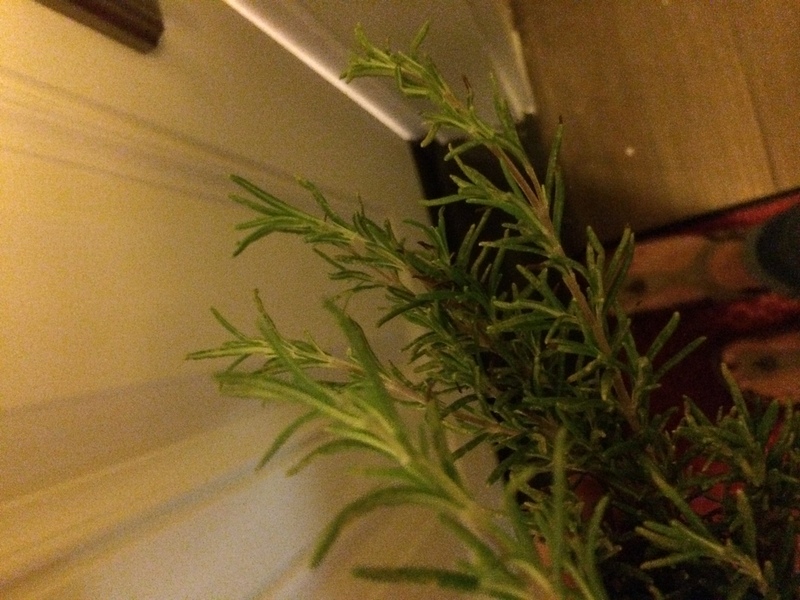 So since moving out of Baltimore, I simply haven’t used rosemary. It’s surprisingly easy to do during the summer months. I couldn’t do it. But here’s the funny thing. It had nothing to do with the cost ($1.99) or the amount (a little goes a long way). It had to do with, of all things, the plastic. I’ll be the first to admit that sometimes I get on a strange kick of social responsibility that seems out of whack, and which really doesn’t have much to do with anything else. Still, I can’t shake it. And recently, I’ve been thinking a lot about plastic: how much there is, how we are starting to see that it never really seems to break down fully, how it hurts precious things like sea turtles. I can’t stop thinking about it, and since tuning into it, I’ve been humbled to realize how much of the stuff there is. Plastic to hold my toothpaste, which I use on my plastic toothbrush. A plastic cup for my water, a plastic jug for the water I keep in my car in case it breaks down, a plastic Nalgene bottle I swing from my fingers as I walk around work with my own personal hydration system, happy that I am at least not using disposable plastic bottle of water after disposable plastic bottle of water. A sandwich bag made of plastic, a credit card made of plastic, a to-go coffee lid made of plastic, a shampoo bottle made of plastic, a phone case made of plastic, a button made of plastic…plastic, plastic, plastic. Anyway, I stood there in the grocery store, this plastic container of rosemary in my hand, and I just. Couldn’t. Do. It. I put it back on the shelf. But what to do instead? I needed the rosemary; it’s important to both recipes and I wasn’t in the mood to start thinking creatively. And then I remembered the bank. On the main street of my town, there’s a local bank with some lovely landscaping. Lovely landscaping of rosemary bushes, that is. What would be the harm?, I asked myself. No one would even notice. So that night, when packing my bag for yoga, I included my kitchen shears. I walked by the bushes on the way to my downdog destination: they were as green and lush as I remembered, as green and lush as you can imagine, infusing the air around them with temptation. How is it possible that no one else has ever done this?, I thought to myself. Hell, maybe everyone does this. A few hours later, after yoga and drinks, I strolled by again on the way home. I slowed down, pretending to be occupied by my phone so that the people behind me could pass. I waited for the moment for cars to stop coming. 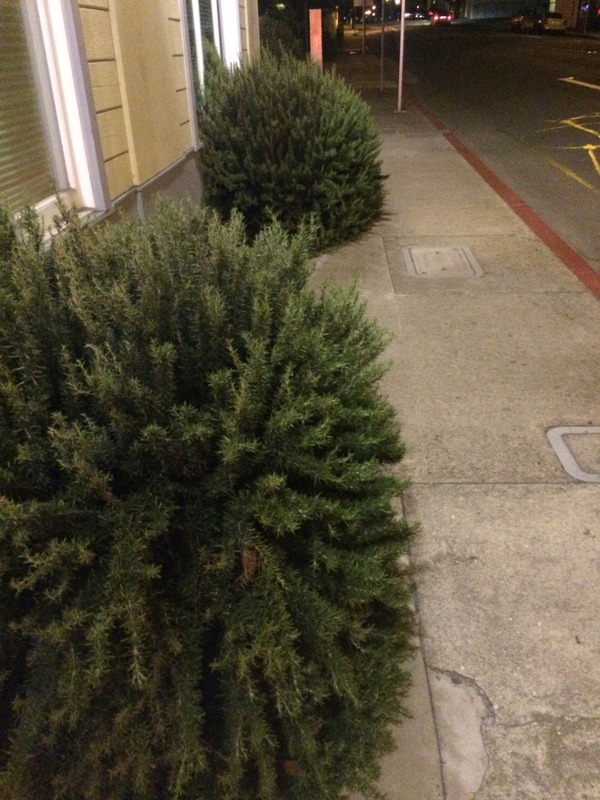 When they didn’t, I rounded the corner to the less obvious rosemary bushes. I pulled the scissors from my bag. Tried to casually snip a few sprigs. Realized it was taking longer than I had imagined, so wrestled off the bits I’d tried to neatly procure. And just like that, as easy as you please, I was on my way home, sauntering along whilst clutching three slightly-hacked stems of that wonderful plant. Free. Plastic-less. Scissors tucked neatly back into my yoga bag, I felt all stretched from yoga and all warm from a cocktail made with kombucha, and I realized: seems that in some ways, I might really belong in this strange land, this California, where plastic is scorned and rosemary is free for the taking. Pilfered rosemary about to walk into my house. Yes, those are Birkenstocks on my feet. This entry was posted in California, Random thoughts. Tagged environment, plastic, resourcefulness, rosemary, rosemary plant.